Good morning and welcome to another week on TAY. I had kind of an adventure on Saturday. It was my sister's birthday party, and I offered to bake a cake. I was expecting something standard, but she wanted an ice cream cake. This one, specifically. I've never made an ice cream cake before, but it wasn't too difficult. If you like chocolate peanut butter or really rich desserts in general, I would recommend trying this! Word of warning though - I'm pretty sure the person who wrote the recipe only meant one 1/2 gallon container of ice cream, not two! I definitely could not fit an entire gallon in one pan. But the real adventure is that I swam in a pool in the sun with a swimsuit on, something I would have never agreed to in years past. Blame Dyram. I'm not sure how, but it's probably his fault. My topic today is games that you had bad preconceived notions of. As you all know I've been playing Tales of Symphonia. Before, I had the notion that the Tales games were all kind of fluffy and dumb and all about frilly characters doing really generic anime cliche things. 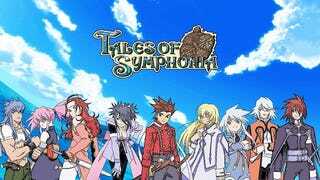 I can't speak for other Tales games, but Symphonia is not that at all. It's a surprisingly dark, deep game, and I am absolutely enthralled by it. Have you ever had a game surprise you like that? What got you to put aside your prejudice and play it? Talk about this, cake, and anything else below!